On Thursday 29th March Leeds charity club night Dancing for Despo is joining forces with its counterpart over in Manchester, High Five. Taking place over three floors at the venue Stage and Radio, the two nights have come together to fund-rave in memory of DJ Despo, who died of testicular cancer in 2013. All proceeds made from the night are going to Macmillan Cancer Support in his memory with £10 tickets available from Skiddle now. Both club nights are known for assembling some of the most notable DJs from the underground dance scene to donate their time and musical mastery for good causes, and this extra special event will be no exception. Rob Mello, Robert James, Burnski, Krysko, Greg Lord, Jonny Wren, Rossa, Bucky, Frenchy, Foz and Mikey Brain are all donating their time in honour of the dearly missed DJ. DJ Despo aka Duncan Michael Wilson was a cherished member of the underground dance scene. 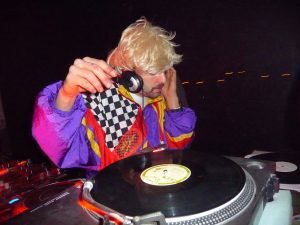 He regularly played at legendary nights such as Leads’ Back to Basics, Birmingham’s’ Below and in Manchester at The Warehouse Project and Tpot, amongst many others, and even when he wasn’t gracing the decks his insatiable character and infectious wit were always at the heart of many such events. Robert James, DJ and ex-housemate of DJ Despo said; ‘The first time I met Duncan we were on the train heading to Manchester where he was playing for the Warehouse Project at the Boddingtons factory. With this latest Dancing for Despo party being held in Manchester it brings back memories of when we first met and I’m honoured that it’s now my turn to DJ in his memory in the iconic city that is known for its huge contribution to the electronic music scene. Duncan was the first person I ever lived with after moving out of my home in Blackpool and is who I was living with when I began making music. I am honoured to be contributing to such a good cause, and to remember the legend that Duncan was in a style that couldn’t be any more appropriate to his character’. The Dancing for Despo events and Duncan’s friends have raised £21,833.74 so far as a collective effort on his Macmillan tribute fund page.